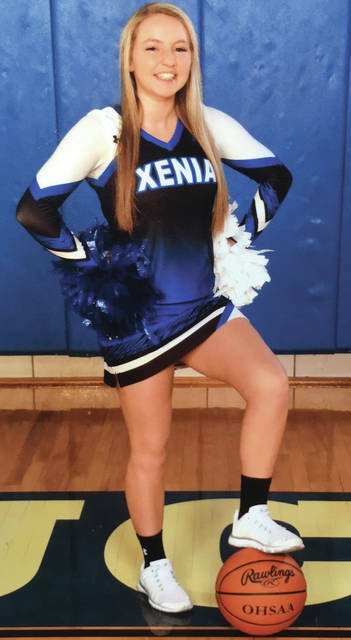 Submitted photos After a couple years away from cheerleading, 2017 Xenia grad Natalie Jones made the Wright State cheerleading squad. Shelby Blocher, a 2017 Xenia High School grad, will continue her cheering career at Wright State. XENIA — Natalie Jones thought she was inquiring about the Raider student section when she approached a table of cheerleaders during Wright State University’s orientation in late June. But minutes later when she walked away, she was one of the newest Raider cheerleaders. Well, maybe it didn’t happen that easily and that quickly. But it was an interesting turn of events for the 18-year-old Xenia resident. Jones, a 2017 Xenia graduate, wasn’t expecting to try out for cheerleading when she approached the table. But she happily did, and along with XHS classmate Shelby Blocher, made the 2017-2018 basketball cheerleading squad. It will be a triumphant return to the baseline for Jones, who hadn’t cheered since early in her junior year. Blocher’s path to the Wright State University Nutter Center floor was a little more direct. Blocher tried out in the spring and was among approximately 50 candidates. She had to learn the routine for the fight song and did some tumbling, jumping and stunts. Jones actually had to put in a little more work to get ready for the unexpected tryout. She became a gym rat, spending at least three days a week working on her skills. And obviously, all is well. Jones said she was told at the tryout she made the team and went right to a team meeting. Blocher found out fairly quickly as well and is happy to have a familiar face on the squad. Though she was away from cheering for a while, Jones still participated in the school’s hip hop team as well as competitive hip hop and credited Denise Adams of Midwest Cheer for her success. “That’s who I learned everything from,” Jones said. https://www.beavercreeknewscurrent.com/wp-content/uploads/sites/49/2017/07/web1_IMG_1471.jpgSubmitted photos After a couple years away from cheerleading, 2017 Xenia grad Natalie Jones made the Wright State cheerleading squad. 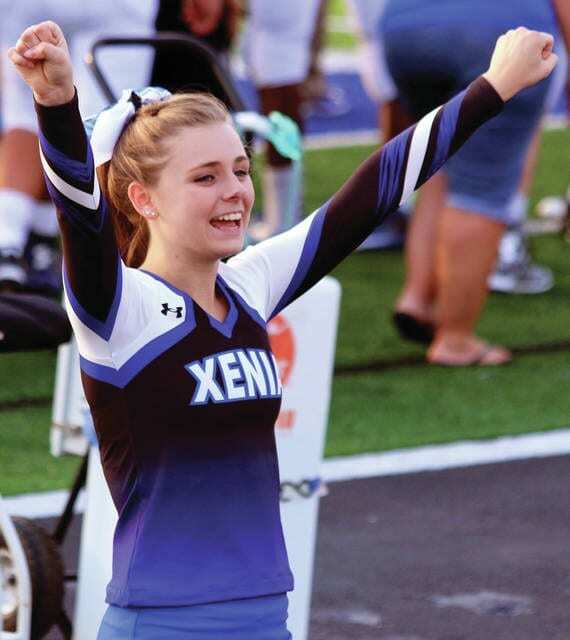 https://www.beavercreeknewscurrent.com/wp-content/uploads/sites/49/2017/07/web1_Shelby-copy.jpgShelby Blocher, a 2017 Xenia High School grad, will continue her cheering career at Wright State.